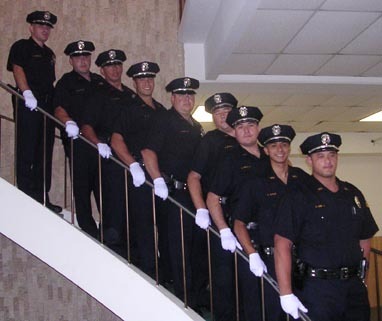 Members of the Hawaii Police Department’s 68th Recruit Class. 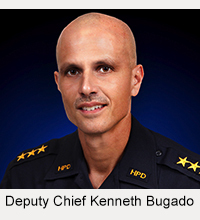 Nine members of the Hawaii County Police Department’s 68th Recruit Class graduated Wednesday (November 15, 2006) during ceremonies held at the Hilo Hawaiian Hotel. The police graduates, who underwent six-and-a-half months of intensive training, will now undergo nine more weeks of on-the-job field training after being assigned to veteran police officers. During luncheon ceremonies, the class president, Cacique Melendez, said it was a sad time as well as a joyous one because now he and his classmates won’t see each other as much as they did during training. U.S. Attorney Ed Kubo called the graduates heroes, saying they, like members of the armed forces, are on the front lines to protect Americans from terrorism. He thanked them for taking the oath to uphold the law and for risking their lives to protect others. 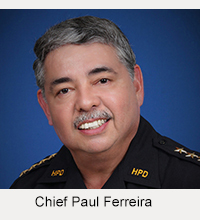 Chief Lawrence Mahuna told the recruits he considers the Hawaii Police Department the best in the state. “That badge that you wear is a symbol of honor,” he said. Also wishing the recruit graduates well were Police Commission Chairwoman Pudding Lassiter, Hawaii County Managing Director Dixie Kaetsu and Deputy Prosecutor Sandra Freitas, the keynote speaker. Two of the graduates received special recognition for their excellence in training. They were Bryan Tina, who excelled in both academic training and physical fitness training, and Richard Nery Jr., who excelled in firearms training.